Many of you have been following my journaling of the opening of my new restaurant, but this past week's r&d trip was especially interesting so I am giving it its own topic. I've made a number of trips over the past year but as my knowledge grows, I'm able to be more focused in my study, and that's leading to some really interesting stuff. The question that I'm seeking to answer is - What is Ozark Cuisine? At the most basic level it's the ingredients and techniques used to create food in the Ozark region. 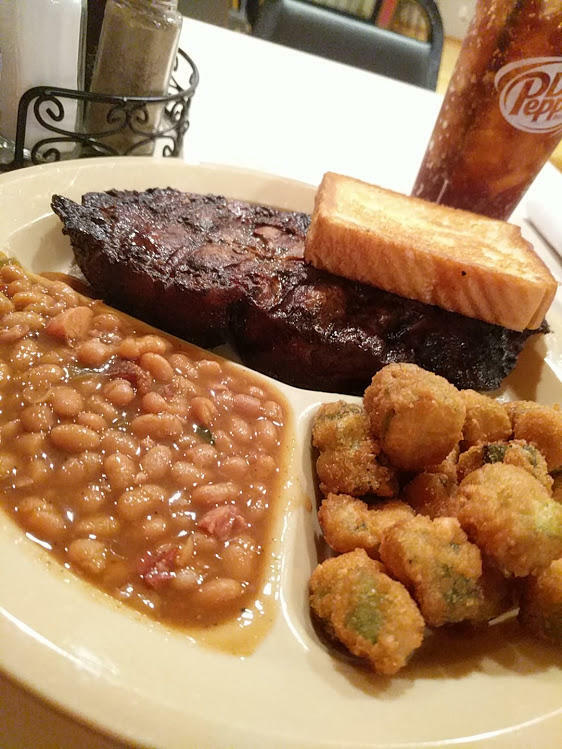 But, the question is also - How does it differ from Appalachian cuisine, or the larger concept of Southern cuisine. I'm approaching the questions from the perspective of geography, and the various people who make up the region including the Euro-centric immigrants, indigenous people (including Cherokee and Osage), and the enslaved people. I have also learned that 1920 is the my line of demarkation. Anything after that point is tainted because that is when companies started popping up to gather local recipes, add them to existing recipes, and then print them as cookbooks for churches to sell. Once that happened, homogenization followed and there are only rare instances of recipe purity. And so I focus on historical evidence. 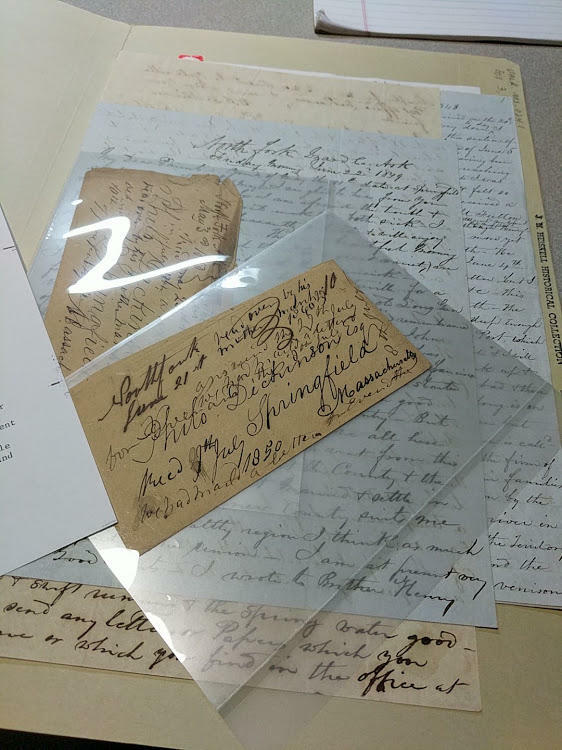 I've connected with all the key researchers and the various libraries that house rare books related to the Ozarks. With that brief backstory, here's my latest trip. I had a few primary destinations for this trip, but I'm always looking for sources of ingredients too so I had many "if I have time" stops added. First up was Eminence, MO. Eminence has all sorts of Ozark history, and it is of particular interest because it's an isolated pocket that is remote enough that it retains its cultural identity. 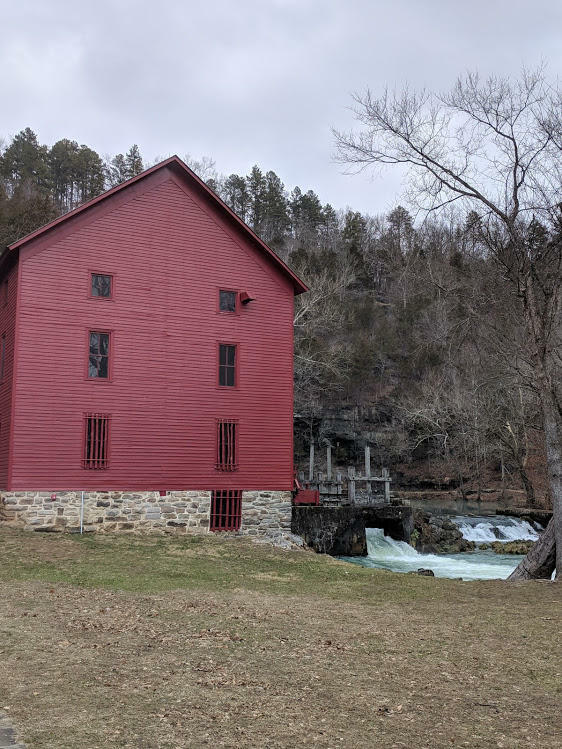 I had previously visited a town just to the North called Shannondale, which holds an annual Ozark folk craft camp each summer, but that was before I had committed to learning the history of the region. Nowadays its all about float trips and fishing, but back in the days it was logging. In Eminence I met up with a local historian who had reached out to me, who wanted to make sure I knew about Ozark culture in his area. His family traces its Ozark lineage back to the 1860s, and his mother still lives in the old ways albeit in a much more comfortable home. I arrived at his house and we jumped in his big ol' truck (I had a reporter in tow too for this leg of the trip), and we drove off so he could show me the various homesteads. If you google the area you'll see that most of the land is s combination of state or federal lands. Missouri has an impressive amount of state parks and conservation areas, and they are really well managed - I say that as someone who is very protective of public lands, but also believes in the importance of using the lands in a responsible way. One of the geologic characteristics of the area is the vast amount of springs, and as a consequence, caves and caverns. This is limestone country, and the water shines a beautiful green-blue as a result. 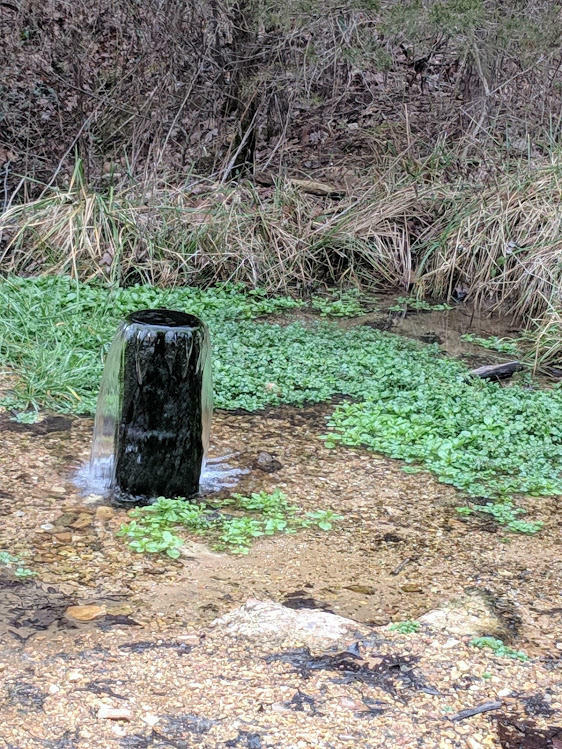 This is an artesian well, which I was less impressed with than seeing all that fresh yummy watercress! The Alley Mill has been saved by the feds. Not in use anymore, the amount of water that still pumps through from springs in unbelievable to me. The spring source is not even 75 yards from the building and it flows 81,000,000 gallons a day. I can't even fathom that much water flowing up out of the ground that quickly...but it does. 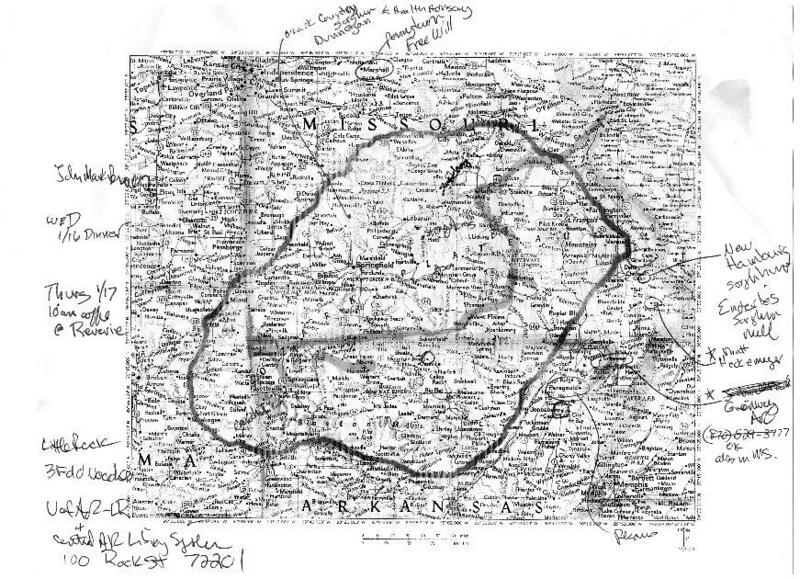 Most of the driving was spent talking about historic hunting, what his family ate, and me asking detailed questions about things such as lard storage, meat smoking techniques and such, and always testing whether the info was modern or traditional, and Ozark or Appalachian. 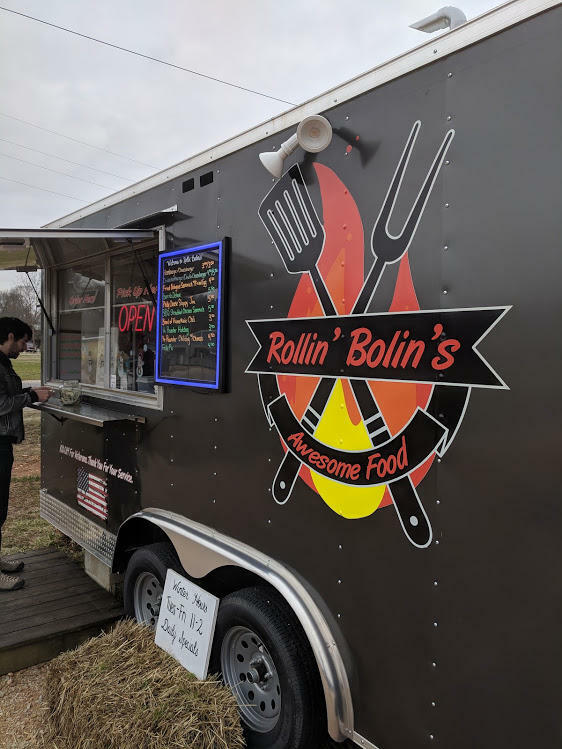 But then it was time to hit the road so i said my goodbyes and grabbed a bite at a new food truck - Rollin Bollin'. 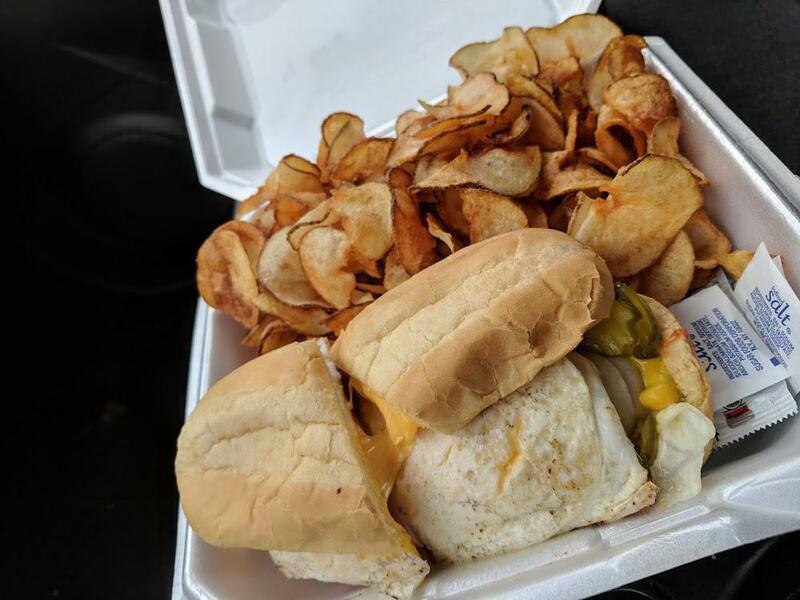 They had all the usual suspects - burgers and such, but I had to get the fried bologna sandwich since I don't see those often. I later learned that those have a long history in the Ozarks (and I'm sure elsewhere). Here it was cut thick on bias, griddled until there was a light crisp and topped with a fried egg. But I had to hit the road and high tail it because I had tickets for an Ozark dinner in Bentonville, AR that night at 6 pm and was meeting a group of friends for the event. I took all sorts of country roads until I got to Springfield, MO when I could jump on the interstate, which ultimately got me to the Crystal Bridges Museum. I really need to get back just to see the museum. It looked amazing but I didn't have time on this trip. I arrived just as they were opening the doors for the event - High South Moments. 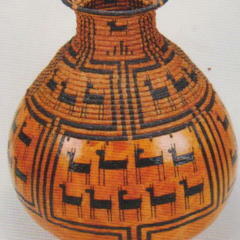 HSM is a series of events that the museum does to explore the heritage of the region. There's a bit of jockeying and marketing going on with terminology, and somethings I'm having to put considerable thought into. I'm looking at Ozark Cuisine. The NWA (Northwest Arkansas) area is trying to cultivate the term High South Cuisine. And a chef up in Springfield, MO is pushing Ozark Plateau Cuisine. 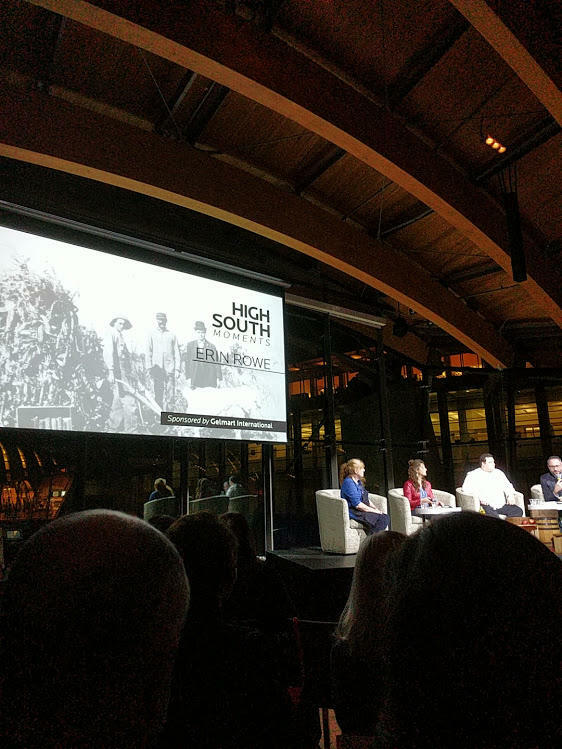 High South was started about 7 years ago (best I can tell) by either an area college's culinary program or by Crystal Bridges (as told to me by their director on this trip). I embrace Ozark Cuisine even though having a tidy definition is impossible, but it is a celebration of the people and the land defined by the Ozark Plateau. And while that could lend itself to the Springfield chef's phrase, I think that muddies the message. 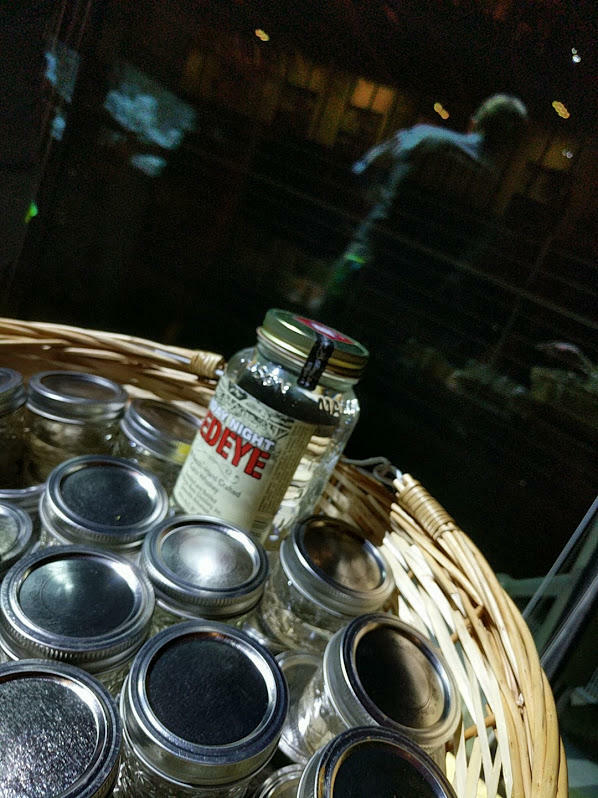 Regardless, when we walked into the venue we were given a jar of moonshine! They also had mulled wine, which was yummy, but I have not seen any reference to that in my research. Alcohol, in general, has not shown up too much in my research which makes sense because of the temperance of the time. 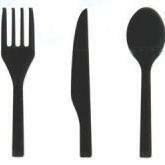 But I have found a few tidbits. The presentation was preceded by rabbit pie, cornbread with sorghum butter, smoked fish spread and a few other items. The presentation was a conversation with Chef Erin Rowe, who I met through her book An Ozark Culinary History. She and the panel talked about black apples, ham, cornbread (no sugar), and the communal aspect of Southern cooking. The talk was brief, and I had planned on sitting down with Erin the following day, so we took off for tacos! 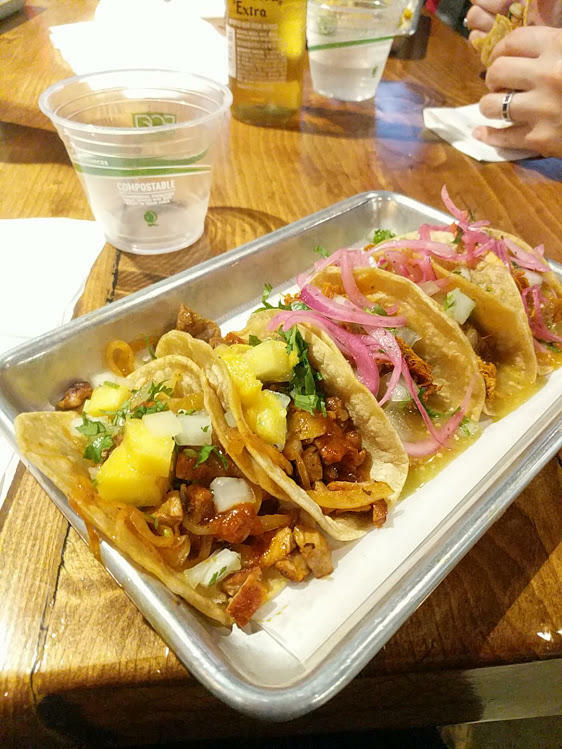 Yeyo's Mexican grill grew up out of a successful food truck, and not is housed in a really cool complex of other food related businesses. The 8th Street Market is a community food hub that has a community culinary school to teach traditional food preparations like canning. The whole package is worth reading about and experiencing. But was tired from the long drive so off to bed for me at a friend's house in Springdale 30 minutes south. 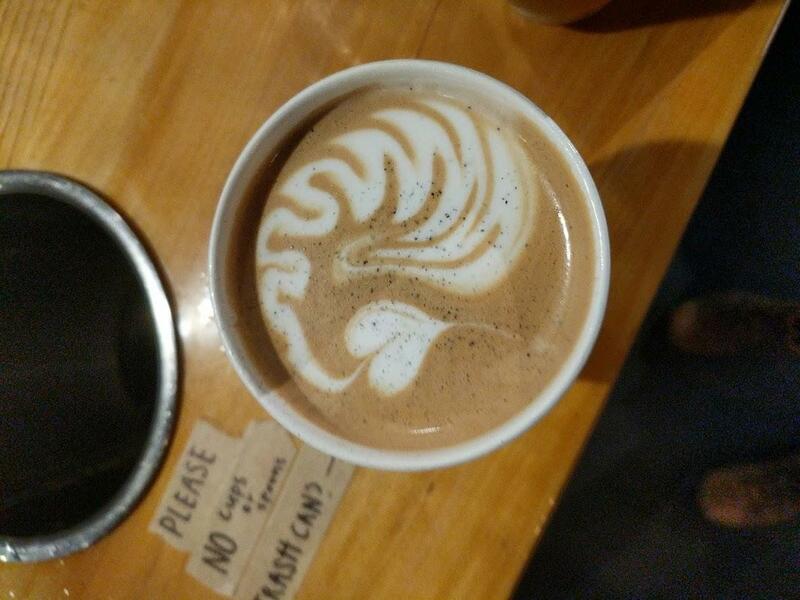 On a previous trip I was put on to Onyx Coffee Lab, and in particular their black salt mocha. I am now totally addicted! 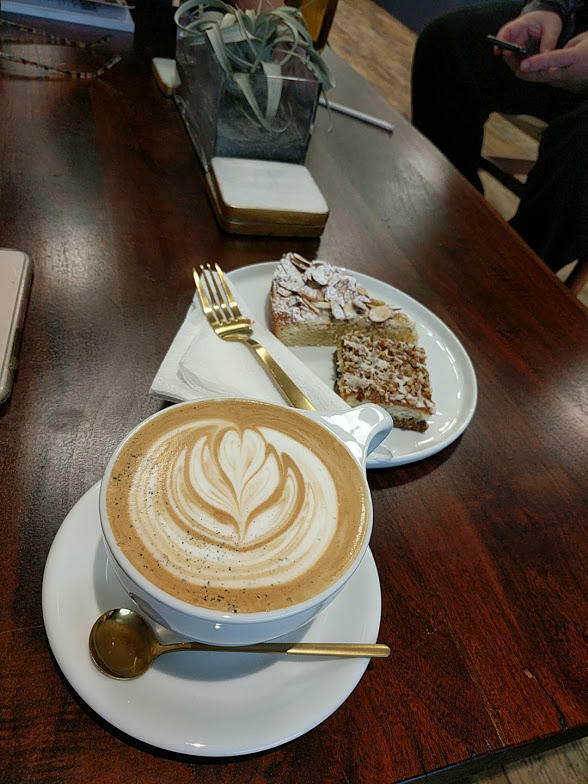 That was my 8:30 am coffee...then I headed to my morning meeting for my 10 am coffee which the owner of the next shop Reverie made a black salt mocha just for me because she heard I was addicted. Turns out, she used to work at Onyx so she knew exactly how to make it. And she made one heckuva almond torte. But the point of the get together was not the coffee, it was a gathering of minds. 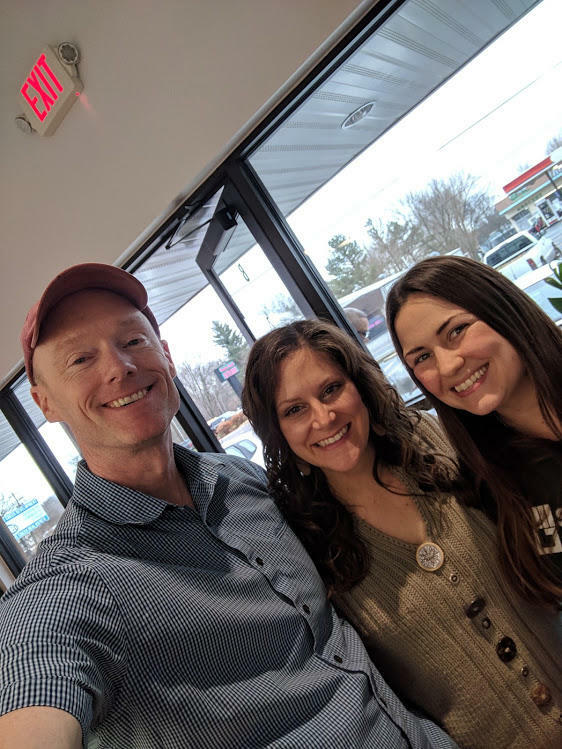 To my left is Cher Erin Rowe (from the previous night's presentation) and Rachael Elizabeth, an Ozark forager who blogs as Once Upon A Weed. All three of us have done extensive research on the Ozarks, yet we all have slightly different emphases. I'm focused on historic cuisine. Erin is focused on modern foodways. And Rachael is focused of foraged and wildcrafted ingredients. But we all have interest in all of those areas. Essentially we spent about four hours talking through all sorts of stuff and comparing notes. Rachael introduced us to Osage Orange seeds being used for oil, Erin talked about cornbread styles, and I talked about changing terminology. Really great meeting, and we all agreed a unified voice could do big things for Ozark foods. Then in true eGullet fashion I was off to eat as many things as I could before I had to leave the next day. First stop was Gooseberry Pie Shop. 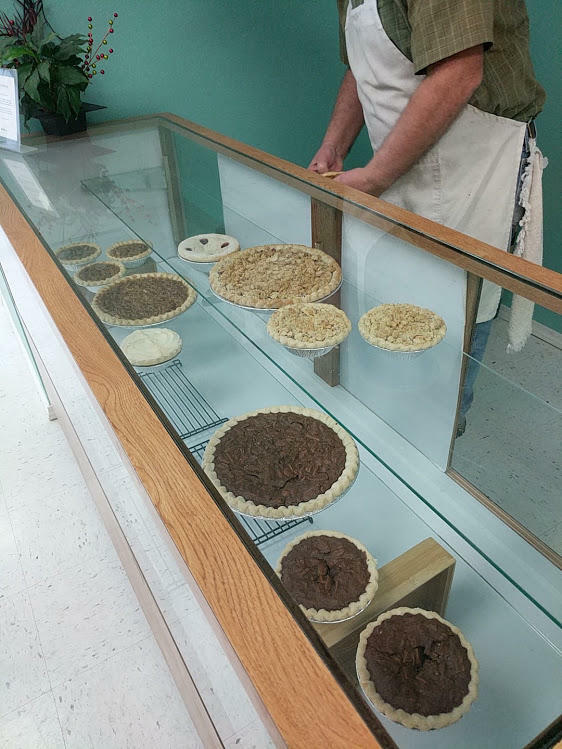 They were picked over by the time we got there around 2, but we still were able to get four small pies - gooseberry, apple with salted caramel, chocolate meringue and bourbon pecan. The gooseberry was my favorite with its slight tartness. I have heard that their opossum grape pies are made by them seeding each grape by hand with a sort of needle. That's more work than I'm interested in. Then it was off for a sandwich at Natural State Sandwich Stop. My host friends love this place and talked about the crazy combos. I didn't see anything too crazy, but apparently their "thing" is to build super tall sandwiches, which while fun, are a pain to eat. 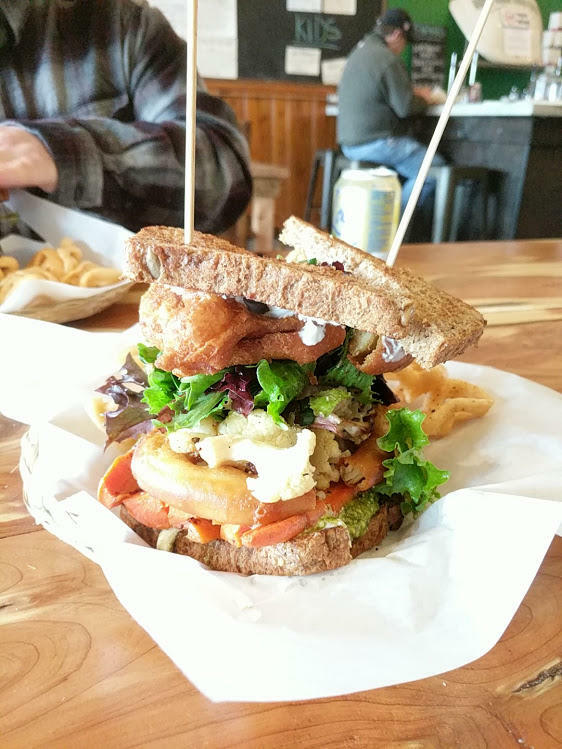 I had the roast veg with herbed goat cheese spread and onion rings on the sandwich. It was delicious but mostly eaten with my fork. At this point I was crashing hard so it was time for a nap at home. Chef, didn't you have a blog before about the mid west? I had a friend years ago who grew up in Hermann MO and was Miss Kansas City in 1969. Her family were were of German heritage and in that area it was so much German food...mainly from southern Germany. I had forgotten about that...it was over a year ago HERE it is. That was focused exclusively on the Ste Genevieve area which is the eastern most edge of the Ozarks. Thanks for this. A part of the world and a cuisine I know nothing about, but an interesting read. I can attest that people in Arkansas raised rabbits, like my late Aunt Helen. We swapped it for chicken and pork that my grandparents raised in return for their help in harvesting and butchering the animals. I remember rabbit being fried for breakfast. There were no pies in my experience. Not saying rabbit pies would be a bad thing. It sounds very good to me. I can say that rabbit is the cheapest meat you can raise. They breed like well, rabbits, and they are very cheap to feed. It rags me out that the ones available at the Farmer's Market, which is the only place they are available here are so extremely expensive. I remember being able to buy this meat in supermarkets when I was a kid, and it is a good meat, a green meat that uses little resources, but I guess, because everyone thinks we are eating the Easter Bunny, it has turned into an expensive specialty item. I grew up on rabbit in Springhill, LA which is right next door to both TX and AR. I would love to see rabbit come back into the mainstream for the dinner table. They are cheap and green to raise. We just have to get past the Easter Bunny thing, and then we can get on with cheap and very good meat. I ate a lot of rabbit growing up, as well. My father snared them and occasionally potted one with his little .410 shotgun, and we also raised them occasionally. We mostly ate them as stew, though fried was not uncommon either. I could skin and gut one with my pocketknife by the time I was 7 (during those brief intervals between losing pocketknives, at least...). @Thanks for the Crepes Rabbit was my primary protein at the old restaurant. I had a local 4H kid raising white satins for me to 12 weeks. Charged me $13 per rabbit, skinned. I rarely served beef or pork, so rabbit and duck were what I focused on. 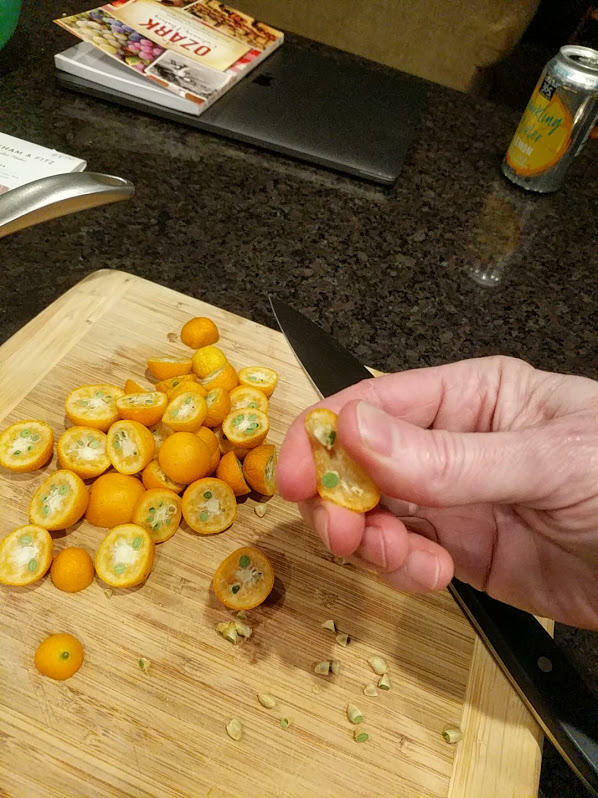 Later that night we are all feeling pretty full, but I was getting antsy and saw a bowl of poor kumquats sitting around drying out, so i took over the kitchen and made kumquat moonshine marmalade. I used my patented technique of removing seeds (cut, pinch, twist) and then just made a straightforward marmalade finished with the moonshine we were gifted at the talk the night before. Then because I was still antsy I made a lemon curd which I worked into an ice cream base, and then we made a fresh bowl of lemon cream ice cream. I finished it by making marshmallow fluff and then topped it with the marmalade. It was pretty good. The next day I drove over to Little Rock, which is a gorgeous drive btw, to the Little Rock Central Library which houses a rare documents collection for the Ozarks. 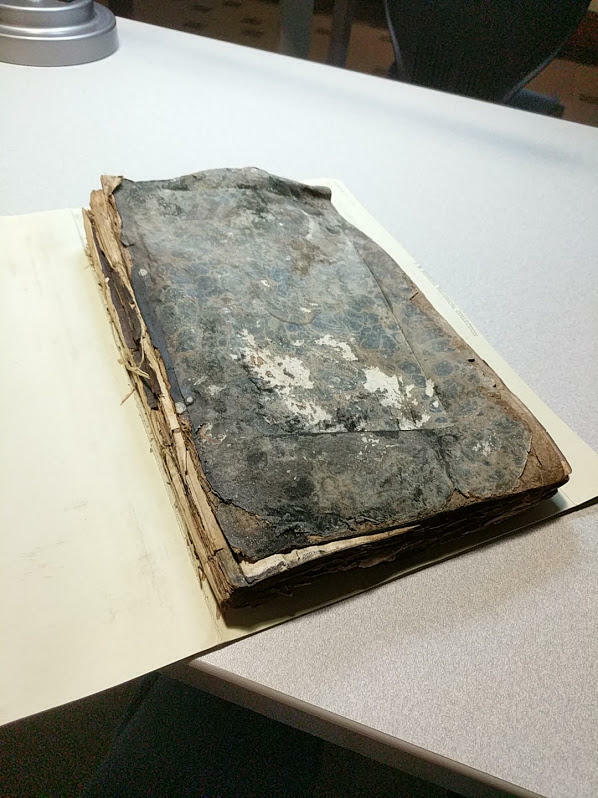 My primary goal was to lay hands on the oldest known cookbook from the Ozarks, but the visit turned out to be far better than I imagined. By searching their database for Food, Hunting, Game, Crops, etc, I was brought out all sorts of documents. Here's an old envelop...I love the penmanship of the time. And the oldest was this one from 1822. The writer was homesteading in a very rural area. The letter talked about interactions/trading with the indigenous people, and learning to hunt, and such. 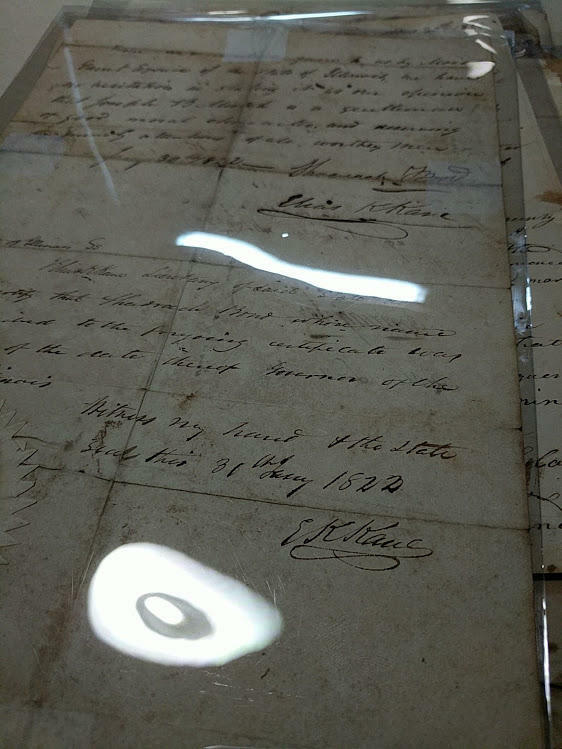 I was amazed that I was allowed to touch the actual documents. They had a person standing behind me the whole time but I was allowed to remove the paper from the sleeves to examine things more closely. 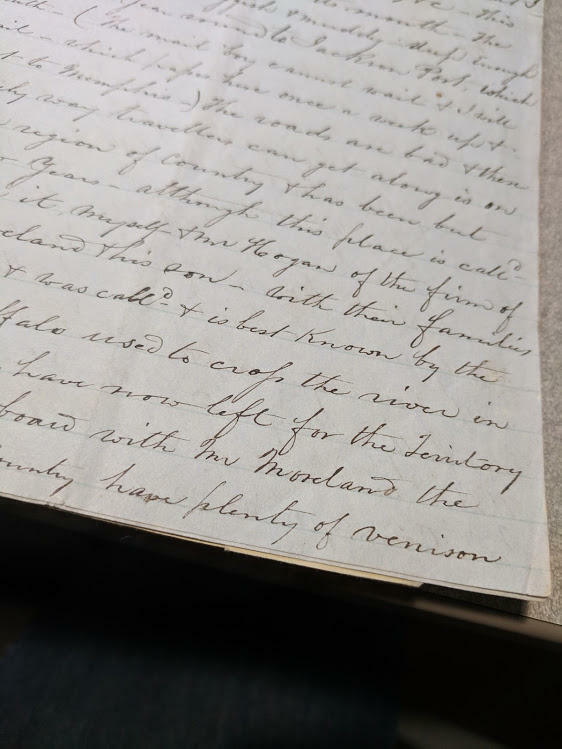 This letter talked about the hunting and fishing in the area, which gave me a good sense of what meats they valued. 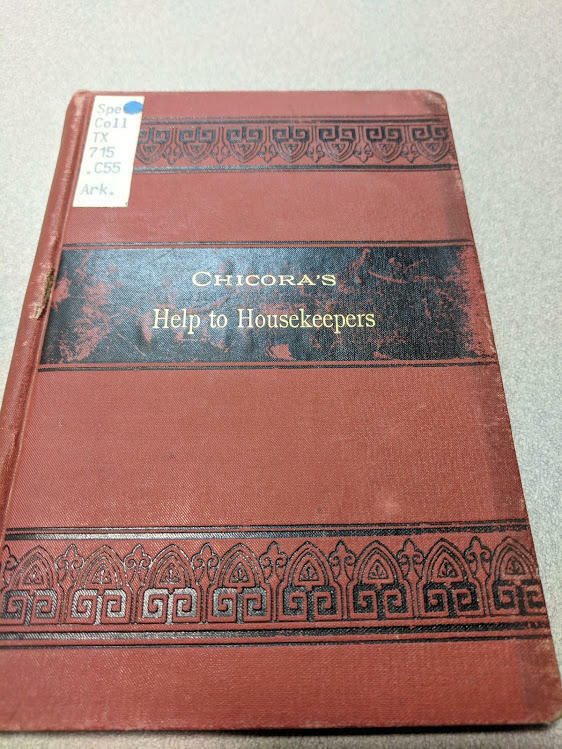 and finally they brought me Chicora's Help to the Housekeeper. I was less impressed with the book than I expected but still some important stuff. I've been told this was the last book to use paragraph instructions for recipes instead of list format. Two things to point out. First is eel. Yes, we have eel in our state rivers. No one that I've found so far is catching them for food, but they were in the olden days. The second thing to note is halibut. 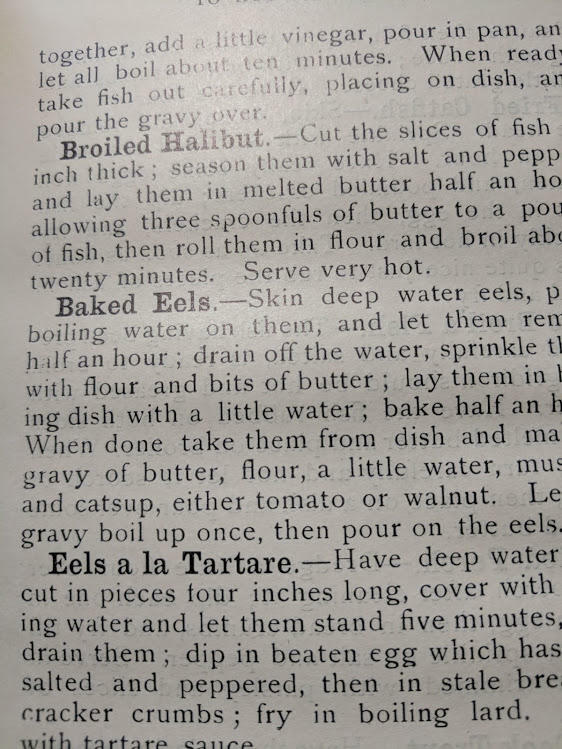 No, there are no halibut in local rivers, but interestingly my historian friend on the first day had already explained this. He said that it was common for immigrants from other areas to come to town and make their favorite recipes using local ingredients, and in many cases the name would stick throughout time. The other thing I learned is that trout, which are raised all over the area, were introduced in the 1950s, but did not exist prior to that. Largemouth, spoonbill, drum, suckers, goggle eye and perch would have been common prior to 1950. 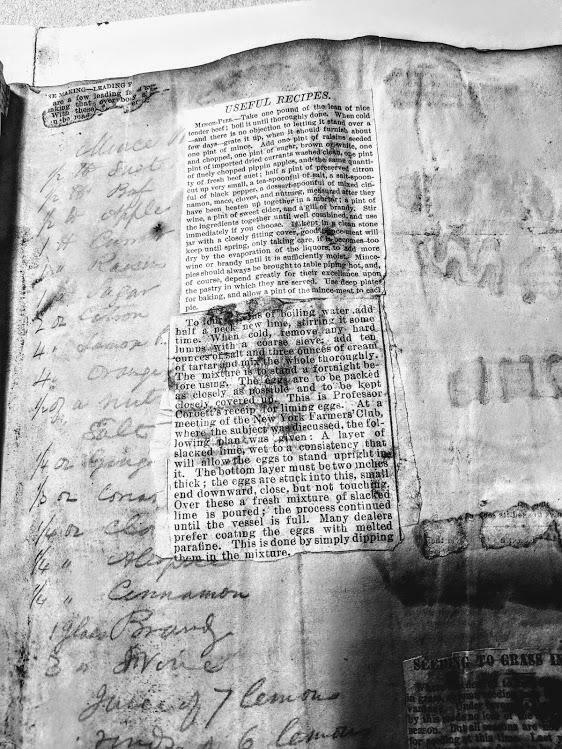 The coolest find was the Heiskell family scrapbook from 1840-1872. Inside were about 50 pages of recipes and herbal remedies. This is one I could not believe I was allowed to touch! So it was a great visit to the library! And now I want to do this full time! But then i was off to visit @kayb in Jonesboro for a coffee and chat. She shared her family memories of canned tomatoes, sorghum and let me ask very basic questions about how kitchens were set up. And lastly I drove to Strawberry's BBQ at Kay's recommendation and got their famous pork steak. Wow. That is a LOT of fruitcake. 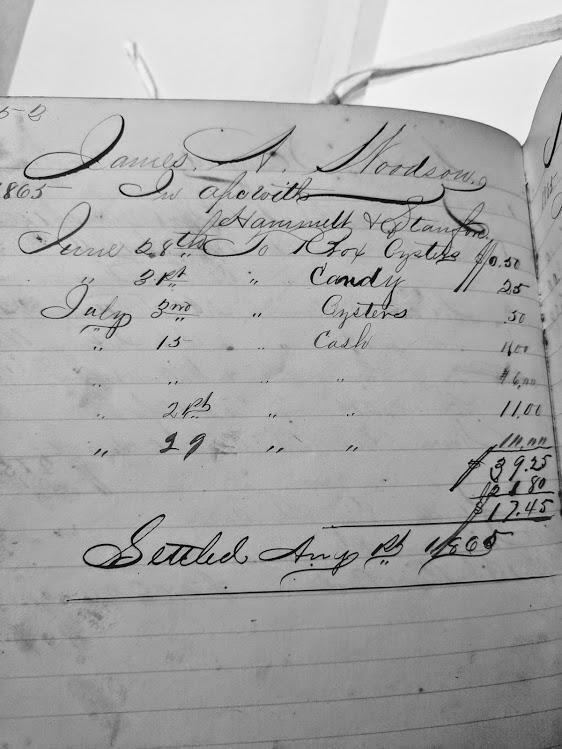 A place where I used to work had documents going back to the late 1800s. The penmanship was amazing, the same as what you posted. I used to look at these documents and wonder what the original writers might have thought if they knew that 100 years later someone would be looking at them. 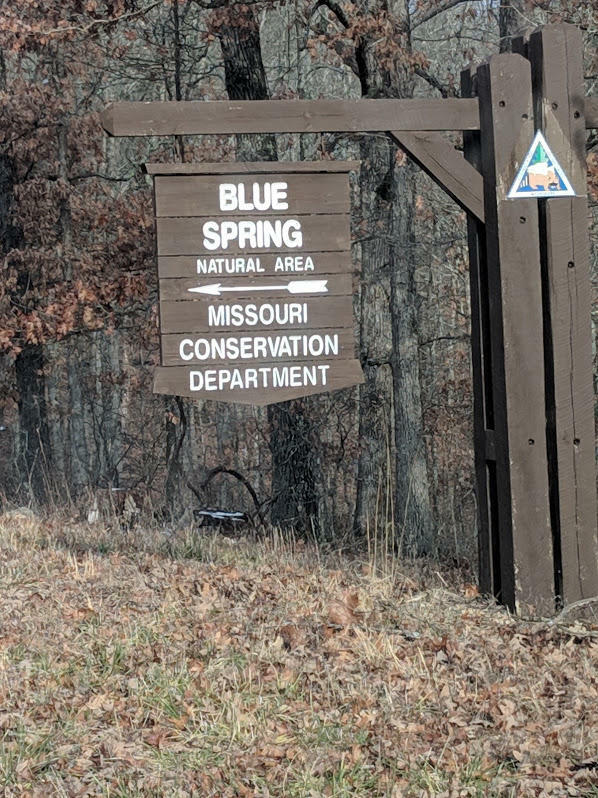 If you had told me a month ago that I would’ve had the slightest interest in the cooking of the Ozarks I would’ve sent you to get your head examined. Now I look forward to every installment. Thank you so much for sharing your experience. It is completely fascinating to me. It’s been many years since I’ve done any library research but I was at one time a research assistant for an author and I do remember how much I enjoyed that work. I can understand you wanting to do it full-time but it won’t pay the bills. Rabbit meat played a large part in my childhood as my uncle was an estate manager in Lincolnshire. At least that was the story I got. I have often wondered whether poacher might’ve been slightly more accurate. I have a wonderful memory of a rabbit pie my aunt made which I was allowed to stay up for and eat well past my bedtime. I would drink a black salt mocha in a hot New York minute. That sounds so good. That's very interesting about the black cake. I have an ancient recipe called Old Kentucky Black Fruit Cake. It is labor intensive and has a zillion ingredients. I made it twice, but that was a very long time ago. No idea where it came from. It uses mostly dried figs, several kinds of nuts, and candied orange peel, among other things, including grape juice. The final ingredient, added just before baking, is a glug of melted bitter chocolate mixed in. The recipe calls for periodically pouring wine over the finished cakes to preserve them, but my notes indicate that I used whiskey or rum. And they also indicate that whiskey was used in the actual cake as well, along with the fruit juice. The quantities specified in my recipe are also generous, although not quite as ambitious, calling for 12 eggs and 8 cups of flour, a total of 4 pounds of black and white figs and dates, several more pounds of nuts, currents, etc. These people were baking for an event or for gift giving. I remember it being an awfully good awfully extravagant cake, and unlike any other fruit cake. 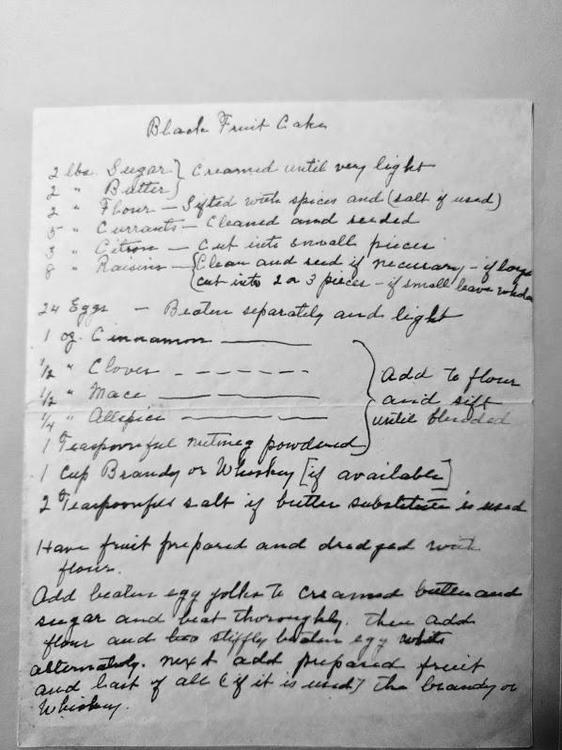 It was indeed a very dark cake, probably due to the amount of black mission figs, the grape juice, and a substantial quantity of dark molasses. That's very interesting about the black cake. 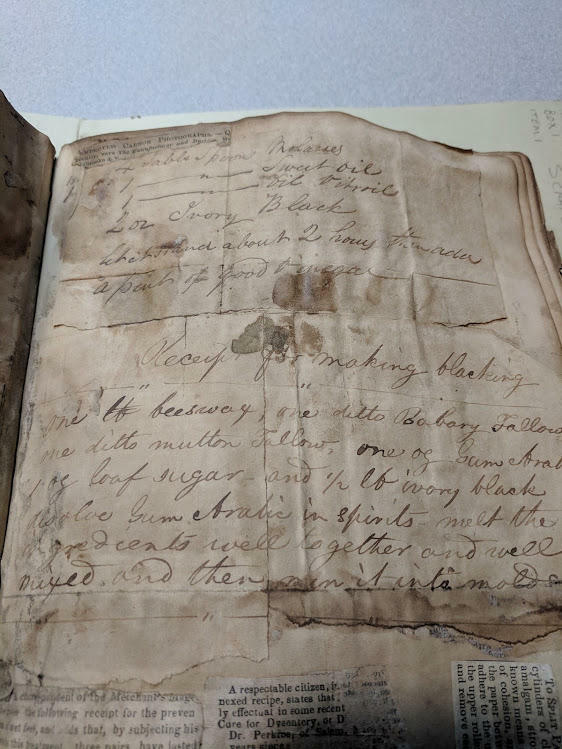 I have an ancient recipe called Old Kentucky Black Fruit Cake. It is labor intensive and has a zillion ingredients. I made it twice, but that was a very long time ago. No idea where it came from. Our daughter's BF is from Grenada and he is aware of Black Cake. (He's the most amazing cook I ever met.) I have no idea if there's any connection or not, but when I hear 'Black Cake', I immediately think Caribbean. The Jamaican and Trinidad versions of Black Cake are more like an English pudding than a straight out fruit cake, but they have in common the use of dark dried fruits (rather than a reliance on candied fruits), grape juice or wine and some type of dark sugar. In the case of the Caribbean cakes the signature is a burnt sugar as opposed to molasses and the use of prunes rather than fig. I noticed that some recipes figured out how to get the wine and the grape juice all in one by using Manischewitz, which I find hilarious. On another day I could see hanging out in bed and reading about this stuff for hours, but this morning I have got to get moving, as I am hosting a birthday party tonight. Strangely, the meal is very southern, including meatloaf and long cooked stringbeans and Vivian Howard's pickled beets and the dessert is pineapple upside down cake--with a bit of rum in the batter--and buttermilk ice cream. There's no Manischewitz wine in my upside down cake. I had enough of that as a kid to drown a horse. A couple of good friends are from, respectively, Australia and Trinidad. He swears by black cake. She makes it, and sent me a recipe. I'm going to try it one of these years, havig never seen a dried fig I didn't like. 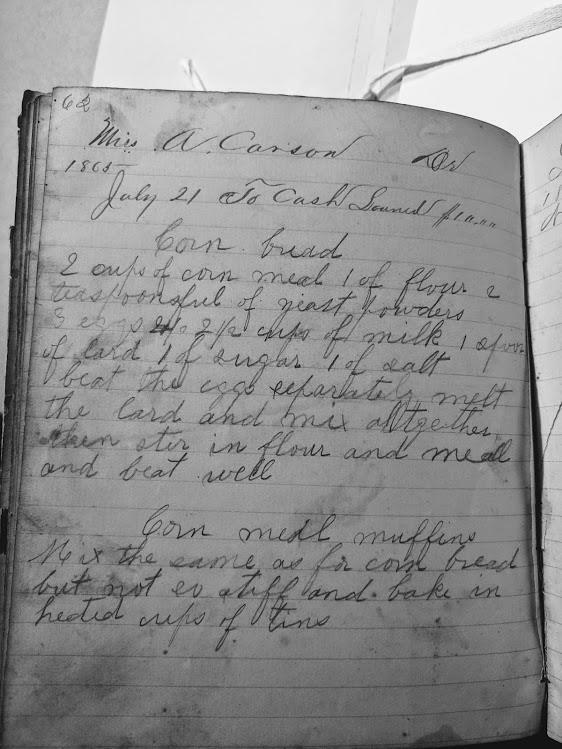 Black cake is a tradition in Nova Scotia as well, probably because of the Caribbean rum/molasses connection. Someone, probably Peter the Eater IIRC, posted a recipe here once upon a time. I love this thread, both the knowledge imparted and the conversations spurred. A natural interest in this topic, and a desire to avoid real work today, led me down the rabbit hole of trying to document some of what I thought I knew about immigration patterns into the Ozarks, presuming, as @gfron1 has mentioned, when folks moved in, they brought their culinary traditions with them. Seems I was mostly right. It does, in fact, appear that many early settlers in the Ozarks had come from the Appalachian areas of East Tennessee, Eastern Kentucky and Virginia. A lot of those settlers came in through ports in Virginia and North Carolina and migrated westward. Other Ozarks settlers came down the Ohio Valley to Cairo, Ill., and crossed the river, or down the National Road through the Shenandoah Valley and west across Tennessee. International immigrants were primarily German and Central European, with a sizeable Italian immigration as well. Lots of German settlements in the Ozarks, particularly in Missouri. This is a fairly interesting (to me, anyway) article on it. You can see a potentially marvelous fusion of cuisines! And the oddity of the Swedes who settled Swedeborg, which seems so random to me. I haven't delved into that town yet. Actually the large volume is because they would make a bunch of fruitcakes that were intended to get them through winter. And I believe the Black Cake here is not the same as the Black Cake from the Caribbean. @hummingbirdkiss turned me on to her favorite Caribbean version years ago. That seems much different than this because of technique. And as many of you make know, (of course) we have a very strong discussion of black cakes HERE in eG. I'm surprised by the complexity of some of the recipes. 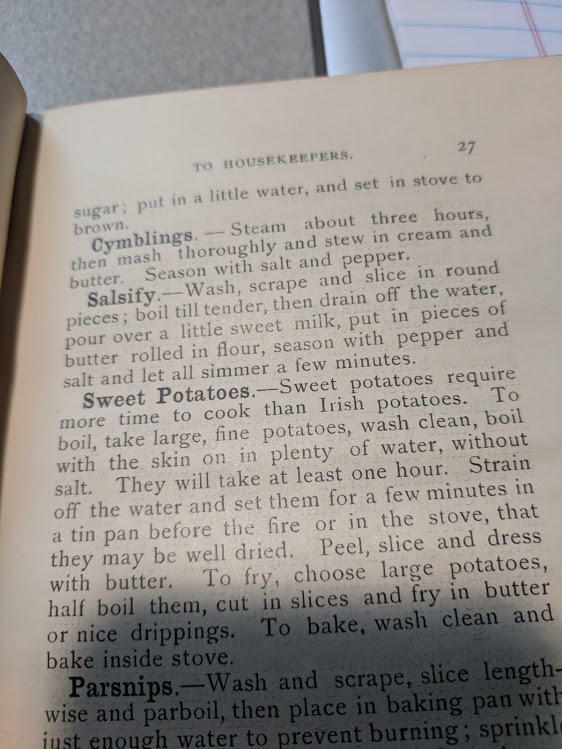 I've studied a LOT of old rural/semi-rural/village cookbooks and the like and the recipes are generally relatively simple. It could be a refection of the social status of those making/eating it, or, perhaps, they're recipes limited to the holidays or other special occasions. An eggless, buttlerless. milkless cake (or other very simple cake) is more what I'd expect the average family to eat—especially during very hard times. Entertainment Cook Book: Recipes by Students of Central College for Women. My mom's War Cake recipe is very similar in style and technique, though hers has more sugar and less fat. Hers has more water and flour as well, so I expect this version makes a softer cake. I always liked the flavor of mom's (made it several times as a kid, just learning to bake) but found the texture to be somewhat chewy.